Finally another American armor crew set in styrene! I have personally been very frustrated for a number of years by DML and their lack of breadth on figures. They have produced but one US tank crew figure set out of over a hundred sets but literally dozens and dozens of German figures, a few Soviet sets, and a handful of Commonwealth ones. With the popularity of American armored vehicles with modelers, this is a shame. 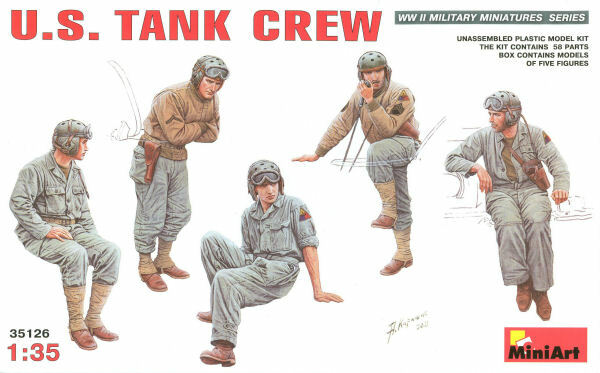 Thankfully MiniArt has now started to step up with other than German tank crews, and this nice new set of American tankers in European garb is greatly appreciated. The set contains five figures: three seated figures (C, D and E), one standing with his foot on a object inside the tank (B), and one leaning out of a hatch (A). All are wearing the basic HBT combat uniform with shoes and leggings, and two of the figures (the two standing) are wearing tankers’ jackets. Four of the figures are provided with goggles, two with shoulder holsters and one with a sidearm holster. Each figure consists of the usual six basic parts – head, torso, arms and legs (the “leaner” has both of his arms together for only five) with a four-piece tanker’s helmet consisting of crown, neck flap and ear flaps. Artwork is by MiniArt’s resident artist, D. Karashik (I think). Painting directions are of the “stick here and use this color” type once used by DML, and color matches are provided for Testors Model Master, Tamiya, Humbrol, Revell, Gunze Sangyo Mr. Color, Life Color, and also English and Russian color titles. Overall this is a great set which will offer a wider possibility to modelers using styrene figures. It’s just a shame DML has ceded the field to other companies.